Good for handling infectious materials, inoculating culture media and routine sampling. Available in either Borosilicate or Flint glass, with an outside body diameter of 7 mm. The ProPette LE™ is the next generation of high precision liquid handling instruments. This newest addition to the Propette family features improved actuation forces and a nearly 20% reduction in overall weight. Every aspect of accuracy, reliability and user comfort has been carefully reviewed in designing these high precision pipettes. The result is an advanced pipette that exhibits superior accuracy and ergonomics and is comfortable to use, even during prolonged and repetitive pipetting. 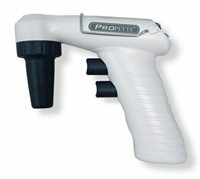 The ProPette series features a continuously adjustable, digital micrometer for volume selection and a non-mandatory volume lock (positioned at the top of the handle for simple one-handed activation/deactivation). Ten models are available for maximum precision at virtually every conceivable volume. However, only four models are needed to cover the standard range from 1µl to 5ml. State of the art technologies and materials have been designed into the ProPette LE's construction, making it an exceptionally lightweight, well balanced instrument. The ergonomically shaped tip ejector button is designed and contoured to minimize pressure on the thumb. Actuation forces and spring pressures have been significantly reduced. When used in conjunction, the pipettes in this kit cover a combined volume range of 2µL - 1000µL. These light-weight ergonomic pipettes offer exceptional accuracy and reproducability, as well as reduced actuation forces for increased user comfort. These state-of-the-art pipettes normally retail for $219 each. But, order the Pipette Pro Pack now and receive a 40% discount! 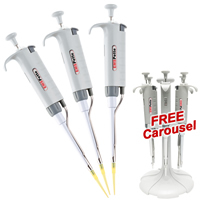 And that's not all... Place your order by December 31st and receive a Universal Pipette Carousel absolutely FREE of charge! That's 3 high precision pipettes and a universal carousel stand for the extraordinary price of $387.00! 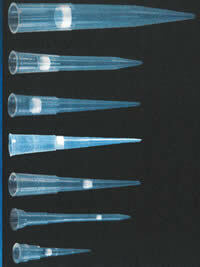 Other pipette sizes available at the same special prices. Ideal for all 96 well applications, the new Propette™ LE Multi-Channel Pipettes are lightweight, rugged, and stand up to the demands of everyday use in a busy laboratory environment. Five overlapping volume options are optimized for maximum precision throughout the 1 to 300µl usable range. Ten models with overlapping variable volume ranges (five 8-channel and five 12-channel) are available, for maximum precision at every conceivable volume up to 300µl. The micrometer is infinitely adjustable to increments as small as 0.02µl (10µl, 20µl, 50µl models). All ProPette LE Multi-Channel Pipettes are compatible with standard 10µl (including extended length), 200µl and 300µl tips, as well as all standard filter tips. 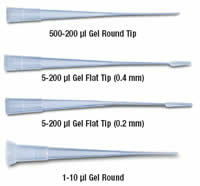 Precision designed pipette shafts/cones ensure easy loading and a leak-proof fit. Each manifold is rotatable and has an integral "dynamic stepped injection" feature which expells tips two at a time, in undetectable micro-increments, reducing the force required to eject all 8 or 12 tips. The ejector button has also been carefully designed in an ergonomically contoured shape, minimizing pressure on the thumb. A manufacturing process that binds a perfluorooctyl polymer to polypropylene resin – resulting in an exposed trifluoromethyl surface. Precision and accuracy are increasingly important in molecular biology labs. A pipetter can be 99% accurate and precise, but the tip can com-promise performance by retaining or binding a sample. KENDALL's low binding tips ensure accuracy and precision by bonding a proprietary polymer to the resin. 0.57mm OD for loading protein gels (SDS Page gels). A white rack. 0.37mm OD for 0.4mm thick polyacrylamide sequencing gels. A yellow rack. 0.17mm OD for 0.2mm thick sequencing gels. A blue rack. WHY KENDALL FILTER PIPETTE TIPS? These pipets are good for blood banking, reagent handling, viscous liquid sampling and transferring, etc. The non-sterile pipets are bulk packed, the sterile are individually packed. The non-sterile pipets are bulk packed, the sterile are individually packed. These pipets are ideal for chemical sampling or transferring, smear blood sample onto slides, mix and spread reagent, slide tests, etc. Available in bulk pack and non-sterile only. These Micro-tip pipets are ideal for loading gels, DNA sample removal, protein assays, lipids extractions, drop-wise additions to culture plates, using 2 ml auto sampler vials, remove or disperse small volumes etc. 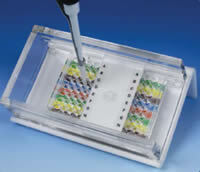 These pipets are ideal for Technique control such as loading gel, PCR workDNA sample removal, protein assays, lipid extractions, atomic absorption spectroscopy-reagent prep, reaction chamber, storage ampoule, portable aliquoting, etc. Available in bulk pack non-sterile, and sterile individually packed. 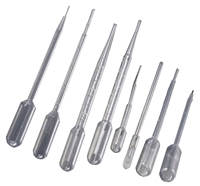 These transfer pipets are ideal for subculturing, harvesting, sampling 15, 50, 100 ml tubes and flask, remove supernatant and media from cell cultures, wash cells, post centrifugation to remove cell layers, layer in columns / transfers in columns, loading gels, field testing, blood culture bottle, etc. These pipets come bulk packed and they are non-sterile. These pipets offer the exact volume of liquid just one squeeze to the bulb. 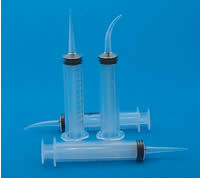 Quick and economical for disposable pipets, without the need of expensive pipetting devices. These pipets come non-sterile. Crystal Grade polystyrene is used for consistency in manufacture and maximum clarity, with easy to read crisp black printed graduations enabling the pipettes to be used accurately to ±1%. Sterile by gamma irradiation. These Pipettes fit all Quick Release Pipette Fillers. 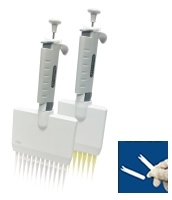 These pipettes are tested for pyrogenicity, and have pyrogen levels of less than 0.25 EU/ml. These unbreakable, one-piece pipettes eliminate contaminated rubber bulbs, broken glass and exposure to infectious materials. They are made of ultra-clear, low density polyethylene (LDPE) and are ideal for microbiology, blood banking, hematology, immunology and urinalysis. Sterile pipettes are excellent for micro-biology and tissue culture applications. Their low-affinity surface reduces sample, cell or protein loss. Whether you make your selection based on length, bulb draw, pipette capacity or number of drops per ml, one of these designs is likely to be suitable for your application. Some have ultra-fine extended tips that allow for extremely precise dispensing and access to the narrowest vessels. They can also be heat sealed for airtight sample storage. Their uniform drop size can be used for reproducible spotting of gels & TLC plates, and for dispensing into test plates, ID strips, PCR tubes or 96 well plates. It works as a syringe. Inexpensive and Disposable. Good for liquid transfering tasks. Each pipette has calibration markings from 0 to 12ml in 0.2ml increments. Tubing may be attached to the tip to suit your application, and tips may also be cut to facilitate aspiration and delivery of fluids of varying viscosities. Syringe dispenser offers a fast and accurate way of dispensing multiple doses of a set-volume. The volume delivered is determined by the volume-selector-dial and the size of the syringe chosen. A chart comes with the unit to help you to choose the size of syringe, volume, and the number of dispenses. The set dispenses 21 different volumes up to 58 times without refilling, with an accuracy of +/- 1.5% or better depending on the size of the syringe. All syringes are autoclavable, except 60 ml size. The above tests are based on water at a temperature of 25°C. 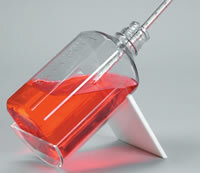 This pipetting device pro-vides an easy, precise way of filling and releasing liquid. By rotating the knurled thumb wheel the liquid is drawn up or dispensed. The soft elastic chuck has a threaded collar that secures the plastic or glass pipette to the device. Sizes are color coded. 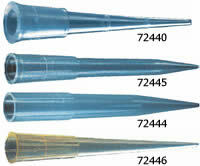 Fits standard or disposable pipettes and diposable serological tooled-mouthpiece pipettes as per ASTM Standard E714-80. Made from translucent polypropylene. Resistant to breakage. Blue graduations, ring mark and inscriptions. Ideal for fluoro and silicate chemistry used. Recommended cleaning with mild alkaline detergent up to 60°C. NOTE: Exposure to temperatures above 60°C may cause volume changes. Precise fluid control at your finger tips. This manual inline pipette controller was designed with an ergonomic grip and bulb for simple and precise operation. It's comfortable to hold and easy to use. With the "T" bar thumb lever, one can control the aspirating and dispensing speeds from serological pipettes from 1 to 100 ml in size. It's simple to operate. Squeeze the bulb to create a vacuum to draw up fluid. Push the control lever backward (upward) to aspirate liquid through a pipette, or push the lever forward (downward) to dispense the liquid. A press of the central bulb on the unit blows out any remaining fluid if necessary. Our ProPette™ Controllers are lightweight and designed to fit comfortably in either the right or left hand. 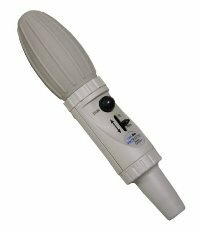 The natural feel of the ergonomic body design, the computer balanced weight distribution and the low pressure fingertip control buttons, all combine to provide a more comfortable pipetting experience. A rechargeable lithium battery keeps the controller running for up to 8 hours or 2500 pipettings on a single two hour charge. ProPette's easy-fit silicone nosepiece accepts pippettes from 1 ml to 100 ml. With its advanced ergonomics, adjustable speed and long battery life, the ProPette Pipette Controller is the logical choice for comfort, convenience and value. The ProPette™ Pipette Controller with QuickStand™ includes charger and plug, benchtop stand, extra filter and replaceable lithium battery. ProPette™ MPC is the high precision manual pipette controller that's always ready to use. After attaching a pipette, one squeeze of it's large rubber filling bulb is all it takes to start pipetting – there are no wires, no tubing and no battery to recharge. 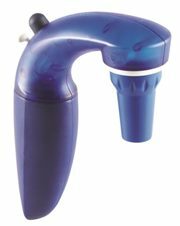 Begin aspirating by touching the EZ-Flow™ lever. It precisely controls the filling speed, based on how gently or firmly you press the lever. A built in replaceable filter ensures optimum flow rate and protects the controller from liquid penetration and over-fill. A separate button provides a positive blow-out function when required. Made to accept pipettes from 0.1 ml to 100 ml, the silicone "chuck" adapter is flexible, completely autoclavable, and will accomodate all types of serological, "blow-out", "to deliver", glass and plastic pipettes. A powerful pump for quick and accurate measurements. 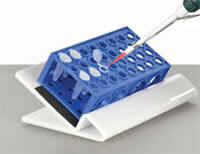 This support is an efficient pipette rest and has an off-center support for short pipettes, syringes, etc. Measurement: 280mm(L) x 215mm(W) x 38mm(H). Compatibility – Ideal for use with a variety of pipets and pipetters, both manual and electronic. 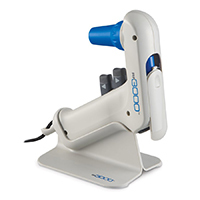 Comfort – Reduces arm and wrist strain allowing pipetting at a comfortable 45° angle. Ideally Sized – Unique design accommodates 200 ml, 500 ml and 1L square and round bottles. Rubber pipette filler. Natural rubber bulb allows safe, manual control of filling or discharging toxic liquids through a pipette by finger pressure (thus avoiding mouth contact). Guaranteed to be consistently flexible. For use with #70950 glass pipettes, 30mm length, 1ml capacity.